A bus leaves Union Station and rolls to the ballpark on Tuesday morning. Photo by Gayle Anderson. 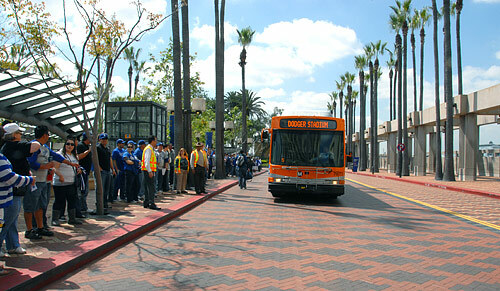 With opening day attracting its usual monster crowds, lines were long this morning and early afternoon for the Dodger Express bus service between Union Station and Dodger Stadium. Metro officials estimate about 1,400 people took the bus to the game. If you haven’t heard the news yet, here’s the gist of it: thanks to a state grant, buses will be running between Union Station and the stadium for every home game and fans with game tickets ride for free. That means there is now mass transit service to Dodger games, just as there is mass transit service to virtually every other Major League baseball stadium. All the details about the service and where to catch the buses can be found by clicking here.